Giant stompy robots make everything better. Well, almost everything. Masonry doesn’t seem to fare so well, as brick, mortar and stone don’t stand up too well to the rigors of alternate-history mechanized warfare, as we can see in this little peek at Iron Harvest, King Art Games’ new RTS in development. It’s been over a year since we last took a peek at this promising game of stompy robots in an alternate-earth 1920s, and it’s looking no worse for wear. 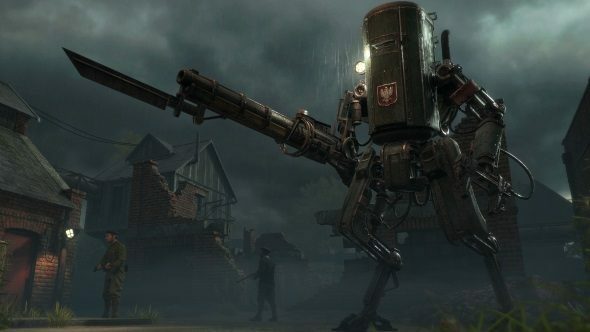 Iron Harvest is looking solid, but it’s a good ways off still. Fortunately, we’ve got everything the aspiring strategist could ever hope to play in the meantime. More than anything, the gameplay shown here reminds me of DigitalMindSoft’s excellent (if anarchic) Men of War series, which simulate the chaos of the battlefield to such a degree that a shell can ricochet off a dead tank hull, fly halfway across the map and air-burst above a vital infantry squad, changing the entire course of a battle though improbable bad luck and impressively simulated physics. It’s that kind of chaos that I’m already looking forward to in Iron Harvest, with every poor decision just opening up new doors. Overextended an advance with a mech? Well, it’s broken now, but at least its shattered hull plates will provide cover for an infantry advance. Forced improvisation is half the fun of a good strategy game, after all. The tech shown in the video above is impressive, going above and beyond on how they calculate building destruction. Rather than just disintegrate in traditional videogame form (even XCom cuts this corner a little), structures collapse dynamically, with towers bringing down walls as they topple sideways. It’ll almost certainly give your CPU a bit of a workout, but given how dynamic it makes the battlefield look, it’s got my attention. There’s no fixed release date for the game, but King Art Games hope to have basic 1v1 multiplayer up and running by Spring of 2018, although I’d wager that any single-player campaign is going to take significantly more time and effort, considering that any AI is going to have to be able to navigate a continually shifting battlefield as well.